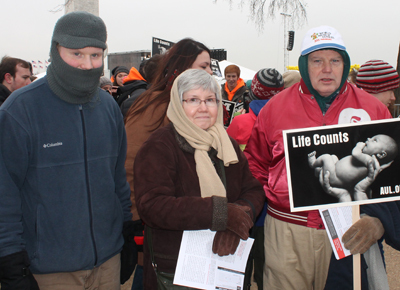 From left, Patrick, Agnes and John Blisard stay warm while participating in the March for Life Jan. 22 in Washington, D.C.
Face it. Pro-life advocates will demonstrate in Washington on Jan. 22 until Roe v. Wade, the U.S. Supreme Court decision that legalized abortion throughout the land, is overturned — or hell freezes over. The latter came close this year, the 43rd anniversary of Roe, but the march went on even though the city was virtually shut down because of the huge blizzard expected to arrive in the afternoon. 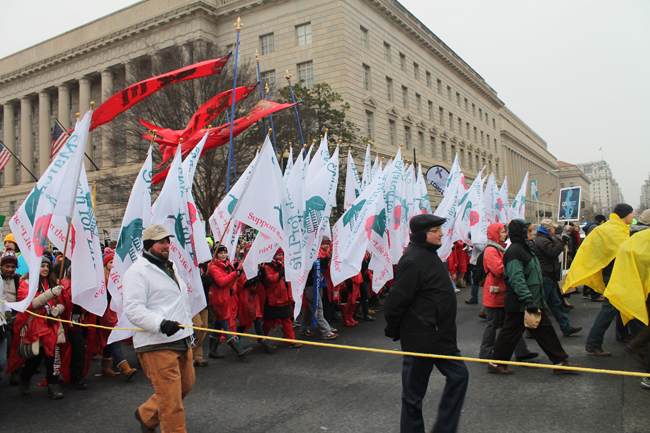 The crowd was considerably smaller than recent years, estimated at nearly 50,000 by Catholic News Service. They first attended the rally to hear such speakers as businesswoman Carly Fiorina, New Jersey Congressman Chris Smith and Focus on the Family President Jim Daly before proceeding from the Washington Monument area up Constitution Avenue past the Capitol and ending at the Supreme Court. Judging by the signs displayed by marchers, most participants at the rally and march were either from Washington itself, or from states at such a distance that they were already en route when the blizzard warning was issued. In the aftermath, according to news reports, busloads of students from Pittsburgh, Nebraska, Ohio and Minnesota were temporarily stranded as they tried to return home. Although 3,000 had been expected to attend from Philadelphia, at the most a few hundred made it. There was no direct cancellation by the archdiocese but many of the parishes and schools cancelled participation, presumably for safety concerns by themselves or the bus companies. Others, including seminarians from St. Charles Borromeo Seminary, went to Washington and participated in the early events, including the Mass celebrated for Philadelphians at the Basilica Shrine of the Immaculate Conception by Bishop John McIntyre. But by the time the rally was completed the snow was beginning, and “I thought for people to leave was the smart thing to do,” he said. 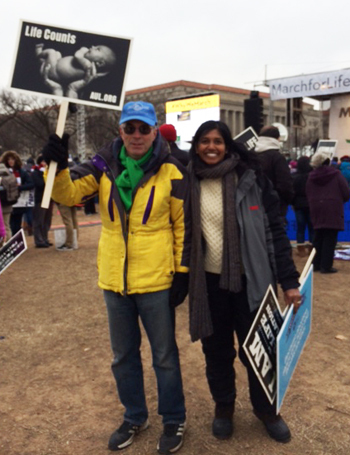 Patrick Stanton (left) and Monique Ruberu, co-chairs of Philadelphia’s 40 Days for Life outreach, attend the rally and March for Life in Washington, D.C., Jan. 22. Bishop McIntyre himself did attend the rally and most of the march. Not everyone was in agreement. For example there were busloads of marchers from Chester, Delaware and Montgomery counties. On a bus from St. Pius X Pius Parish in Broomall were John and Agnes Blisard with son Patrick. Patrick Blisard said he’s been coming for the past 17 years but his mother interjected that wasn’t counting the time when she came when he was in her womb, so it would be 18 years. Another busload of 33 people came from Immaculate Conception, Jenkintown, and among them was Patrick Stanton, the son of the late John Stanton, who was the leading pro-life advocate in the Philadelphia region. “We took a chance but I am glad we went to represent our parish and our archdiocese; I thought the speakers were excellent.” he said. They made the most of the march but had to leave before the very end because the children were very cold. While John Stanton himself, who died last January, could only be there in spirit, a memorial Mass will be celebrated for him by Father Chris Walsh on Saturday, Jan. 31 at 9:30 a.m. at Holy Redeemer Catholic Church, Philadelphia. It will be preceded by witness at a nearby abortion clinic come rain, snow or shine. 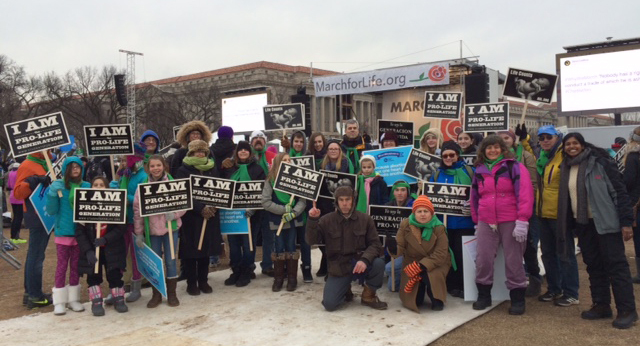 At the rally before the March for Life, a group from Immaculate Conception Parish in Jenkintown gets ready to walk to the U.S. Supreme Court building. I agree that the March should be changed to Spring or Fall. It is time to change the date of the rally to the Fall or Spring.It is well beyond time to force more publicity, as the secular press ignores us. God Bless all of you who represented us so well at the March for Life, especially Patrick Stanton (may John, his Father, rest in peace) and Dr. Monique Ruberu, my new MD thanks to the Pro Life organization . This was to be my first March, and our first Bus from Maternity BVM in Bustleton / Philly, but the bus co. cancelled d/t the State of Emergency declared in DC . Instead, I went to the Funeral of a dear friend’s Mother (age 99), then to Saint Katherine’s Adoration Chapel and said a Rosary for an end to abortion and for the safety of all those who participated in the March .